Last summer I saw a boat, flying the Cayman Islands Red Ensign while docked at a pier on Long Island. My entirely personal interpretation of the Merchant Shipping (Registration,etc.) Act 1993, is that the undefaced British Red Ensign is the primary ensign of a vessel registered in the Cayman Islands, and the Cayman Islands Red Ensign is an authorised option. In schedule 3, para. 1, a British ship is defined as, a ship registered in the United Kingdom under the Act, or a ship registered under the law of a relevant British possession. 3, para.2 (3), a. - colours allowed to be worn in pursuance of a warrant from Her Majesty or from the Secretary of State. b. - defaced or modified Red Ensigns authorised or confirmed by Her majesty by Order in Council for wear by British ships registered in a relevant British possession. I have found that my answer of 21st May was partly wrong. The British Red Ensign is again an alternative ensign for Cayman registered ships, but between 1988 and sometime in the late 1990s it technically was not. Until 1993 merchant shipping of British possessions was regulated by the 1894 Merchant Shipping Act, as amended. By the 1980s it was becoming difficult to correlate amendments and territories. This was a particular problem in the Cayman Islands which had a more extensive register of shipping than other dependent territories. In 1988 an Order in Council, relevant only to the Cayman Islands, codified the 1894 Act together with relevant modifications and amendments, and stated that the Order in Council itself, and not the 1894 Act, was the law of the Islands in relation to merchant shipping. This included a statement that the Red Ensign defaced with the Cayman Islands crest was the proper national colours for Cayman vessels. Due to a drafting error, or through an oversight, no provision was made for the plain Red Ensign. This was corrected by a clause, inserted into an Order in Council of the late 1990s, which modified the flag provision to include the plain Red Ensign as well as the defaced Red Ensign. I have just seen a visiting ship in Bristol City Docks - the 'Intuition II' - with its port of registration in 'Georgetown C.I.'. She is flying a defaced red ensign with the arms on a white disc - and the flag doesn't look particularly old and tattered, so I guess in practice the old design continues to be made and used. The changing of the size of the badge and/or arms, with the deletion of the white disk and addition of a fimbriation is official only in so far such flags are illustrated like this in the latest change in BR20 - Flags of All Nations - published by the Ministry of Defence, and is (as far as I can tell) an entirely arbitrary decision by them. There are, as far as I remember, three (there could well be four or more) defaced red ensigns defined by Schedule, of these one shows a white disk, that of the Falkland Islands whilst two do not, those of Gibraltar and of Guernsey. The remainder may include the traditional white disk or not as the fancy takes them. While visiting Stockholm for ICV 20, we noticed a huge yacht and a sailing boat, both hoisting the Cayman Islands red ensign with white disc. Here is a photo. The use of the red ensign defaced by the national crest, accompanying an article about ship registration in the 2002 Professional Yachtsmen's Association PYA News has triggerede a response in this year's edition from Peter Gibbs, the Director of the Cayman Islands Shipping Registry. He points the finger at an amendment to the Royal Navy's one time bible of flag descriptions, which was apparently riddled with errors. To extract from his article: "All these changes were done without any consultation with the Cayman Islands. The reasoning for removing the white disc was that no such disc had been prescribed in the original warrant. The relative size of the coat of arms was changed so as to achieve uniformity between the flags. Although these arguments may at first appear to be plausible, on closer examination they prove to be specious. If we look to the description of our coat of arms, set out in the Royal Warrant issued by the College of Arms in 1958, we find that it neither mandates nor precludes the white disc. However, customary practice is something very important in the development of flag tradition. The use of a white disc in the background has been customary practice in British territories at least since 1869 and has been common to virtually all Union Flag defacements. The Cayman Islands chose to represent their national coat of arms similarly, and this has been the customary practice since the flag's inception. The Royal Warrant makes no reference to the relative size of the coat of arms on the flag and no reference to uniformity between the flags of different British territories. Taking the proponent's two arguments together, it seems that the absence of any specific reference to a white disc was used as a reason for removing it, yet, at the same time, the absence of any specific reference to relative size of the coat of arms underpinned the argument for imposing a change!" While I sympathise with the view that changes to the Cayman Islands' flags, as shown in an official book, should not have been made without consultation, it is incorrect to say that, "The use of a white disc in the background has been customary practice in British territories at least since 1869 ..."
Most of the early colonial flag badges were circular, and the question of a white disc did not arise. When the badge was not circular, a white (or sometimes coloured) disc was necessary on the Governor's Union Jack, to fill the space between the edges of the badge and the laurel leaf garland. On ensigns, there was no space to fill and non-circular badges should have been placed on the fly with no disc. However in some cases the badge was given a white background disc, either because there was one on the governor's flag and it was thought that the ensign should be the same, or because drawings of badges in the Admiralty and Colonial Office Flag Books were framed within a black ring, and it was thought that the white circle within the ring was part of the badge. In 1916 a note at the beginning of the Admiralty Flag Books reads; "White circles are generally to appear on the Union Flag except where otherwise noted beneath the design. The white circles are not to appear on the Red and Blue Ensigns except where they are necessary to display the design; e.g. where the badge itself has a border of the same colour as the ensign." In a Colonial Office minute of 1918 it was noted that, "..there are occasions for a diversity of opinion, where the border of a badge is not uniform. ", and in 1919 the Colonial Office circulated a questionnaire to all colonial governors and administrators asking whether the flag badge of the colony or territory appeared on a white disc. By 1924, after consultation with the governors concerned, white discs had been removed from the ensigns of nine colonies. Details in National Archives (PRO) ADM 116/1847B. During this period Red Ensigns were introduced for thirteen Indian States with the note; "Unless there is some special reason for obtaining a particular colour around the badge, the badge should appear on the Red Ensign without a surrounding circular disc except that if the colouring of the badge is indistinguishable from the red field the badge shall appear in a white circle." Is the flag with a white disk acceptable? The definitive answer to this would depend upon whether the Order in Council (of 1988) that established it included a schedule with illustration, and whether this schedule (if present) showed the white disk? I am (in addition) not entirely sure whether the 1985 Merchant Shipping Act contained the same provisions as that of 1995 regarding such ensigns, but it is certain that no defaced Red Ensign established by Royal Order in Council after 1995 (and all the ones in my possession contain a schedule as described) can be amended by an arbitrary decision of civil servants to add or delete anything. The short answer is that the ensign with a white disk is probably (but not certainly) the correct flag, and is (in anycase) acceptable. 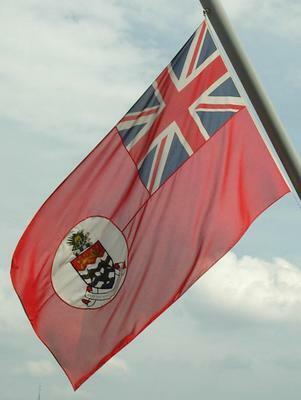 Ships registered in the Cayman Island have the option (the priviledge if you prefer) of flying an ensign defaced with the Cayman Islands Arms, but it is not mandatory that they should do so. The plain Red Ensign remains a perfectly legal option for all British Dependent Territories. I just received a nice old Cayman Islands blue ensign from a friend that was recently there. It is a Porter Brothers piece and according to the heading, was made in September, 1960. I found it interesting in that the wavy stripes on the shield are dark blue and the pine apple has a bit of green flora above it. This is not the first such Caymans badge I have seen and I believe this these images represent how the badge initially looked, at least on actual flags. Foreign civilian ships visiting any British Overseas Territory should fly, as a courtesy flag, the Territory's own Red Ensign, if the territory has one and the ship happens to carry one. The undefaced British Red Ensign is always an acceptable alternative. If the ship is a Foreign government vessel they should fly the Territory's Blue Ensign. Basically the British rule is that you may use either the appropriate Red, Blue or White ensign (depending upon your own status) or the land flag, except that you cannot use the Union Flag at all.